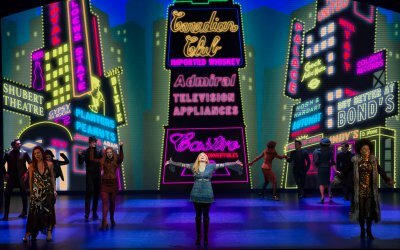 A splashy plotless extravaganza derived from 1960’s pop classics performed by an energetic cast in flamboyant costumes that’s debatable entertainment. Seen while having cocktails during a vacation on a cruise ship or in a Las Vegas showroom Trip of Love might be viewed as an entertaining diversion. Its virtues in a large New York City Off-Broadway theater are debatable. Lasting one hour and forty-five minutes with an intermission, Trip of Love is a splashy plotless extravaganza derived from twenty-eight 1960’s classic pop tunes. Director and choreographer James Walski has conceived a program of catchy sequences based on familiar songs that are at times campy, lively, earnest, eerie and funny. Though it touches on complex societal issues during this turbulent time period in the United States, the show’s overall lack of depth depicting these conditions relegates it to slick opulence. Such a lack of overall substance does often play well in Las Vegas or on the sea but in a midtown Manhattan theater it’s a striking flaw considering the numerous other theatrical options. The show opens with a suitably plaintive solo rendition of “The Windmills of Your Mind” and closes with a raucous full company performance of “Born to Be Wild” with the theme from the Batman television show as exit music accompanied by projections of the show’s memorable BAMs, ZOWIEs, and KABOOMs. These are all a series of good-natured, often loopy, vignettes reminiscent of surreal 1960’s television variety show production numbers. They’re technically proficient but are definitely in the mode of pleasant superficiality with occasional touches of attempted significance. Some of the best numbers include a wistful “Downtown,” with Mad Men– style passersby in Times Square with billboard signs from the era including Castro Convertibles, Bonds and Howard Johnson’s in the background; “Sign of The Times,” with everyone in Yves Saint-Laurent Mondrian outfits; a hot air balloon wedding ceremony for “Up, Up, and Away;” an Alice in Wonderland type woman running through the audience for “Go Ask Alice;” and young lovers in Central Park with a woman in a swing above them for “Moon River.” There’s an elaborate beach-themed “Wipe Out” with lengthy surfing. “If You Go Away” is lushly sung by a woman as two men strip down to their briefs and put on dog tags and fatigues to get Vietnam in. Later they sing “Blowin’ in The Wind” amidst rice paddies and sandbags. A backdrop of the streets of Haight-Ashbury is used for a series of songs. A marvelous highlight is an extended “These Boots Are Made for Walkin” where a young African-American woman arrives in Los Angles to make it in show business and ends up on a television dance show. The principal cast of seven and the ensemble are all-talented, youthful, and attractive. The women are willowy and the men are all athletic. The men are frequently showcased in flamboyant skintight or skimpy costumes and are shirtless whenever possible. The leads are Joey Calveri, David Elder, Kelly Felthous, Dionne Figgins, Austin Miller, Tara Palsha, and Laurie Wells. The ensemble is made of Yesenia Ayala, Colin Bradbury, Bo Broadwell, Kyle Brown, Whitney Cooper, Alexa De Barr, Daniel Lynn Evans, Lisa Finegold, Ashley Blair Fitzgerald, Steve Geary, Daryl Getman, Jennifer Gruener, Brandon Leffler, Peter Nelson, Kristin Piro, and Nicky Venditti. Gregg Barnes designed the multitude of exceptionally executed costumes that faithfully and eye-catchingly recreate the looks of the period. 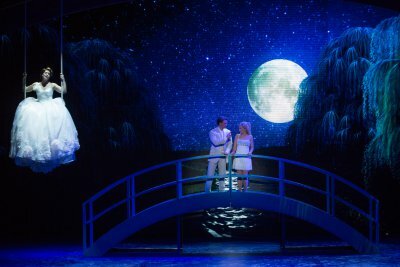 Robin Wagner collaborated with James Walski on the vibrant sets that are strikingly complemented by Tamotsu Harada’s lighting design. The variety of music is very well rendered by Peter Fitgerald and Domonic Sack’s sound design. The major element of the show’s arresting visual quality is the dazzling projections designed by Daniel Brodie. Trip of Love premiered in Osaka, Japan in 2008. As a well-mounted evening of innocuous retro song and dance, it does succeed and that might be enough for some audiences. The beloved classic film gets an underwhelming Broadway musical treatment with its leads struggling to replicate the magic of their movie counterparts. Provocative and powerful new play takes on the emotional, physical and ethical outcomes of drug testing. The New York premiere of this new rock-pop musical, based on David Schulner’s play, “An Infinite Ache,” is insightful, moving and joyful. Fascinating, nearly silent retelling of how The Woodsman became the Tin Man told in mime and puppetry adapted from the L. Frank Baum novels.